Interesting colour for chutney.. and delicious, too! Speaking of “imperial,” a few days ago I made a delectable Afrikaans sausage called Boerewars. I made the meat but didn’t actually make “sausage," because I don’t have a sausage stuffer… yet. But I made the meat. Regardless, after making a 2 lb batch I was left with 1 lb of this remarkable sausage meat to use in some other wonderful way. A friend at work, who also makes boerewars, suggested a great way to serve it was barbecued and in buns with chutney. I could have ran to the store for some nice mango, lime or onion chutney. But Christmas is coming so I decided to double duty the project and make my own chutney from scratch, with enough leftover for several jars to be given as gifts. The word “chutney” is from the Sanskrit word caṭnī, loosely defined as a spicy preparation used as an accompaniment for a main meal. We’ve all had delicious chutneys used in this way, either at a restaurant or at home. It’s hard to think of a curry dinner without it. Because of the loose definition, there is no limit to the number of chutneys one can dream up. Come up with a combination of any vegetable, fruit, herb and/or spices and go at it. What you put into your chutney, or the kind you choose to buy, should depend on what flavours it is supposed to accompany. Chutneys fall into two main groups, sweet and hot. Both contain spices, usually including chilli, but but that’s where the similarity ends. Even within India and Pakistan the types of chutneys vary widely. This is the fruit and other ingredients after 25 minutes. This chutney is “blonde.” It’s a beautiful yellow colour, much like applesauce with some additions. 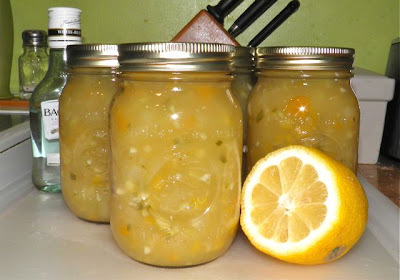 This recipe made six 500 ml bottles of a consistency of apple sauce. 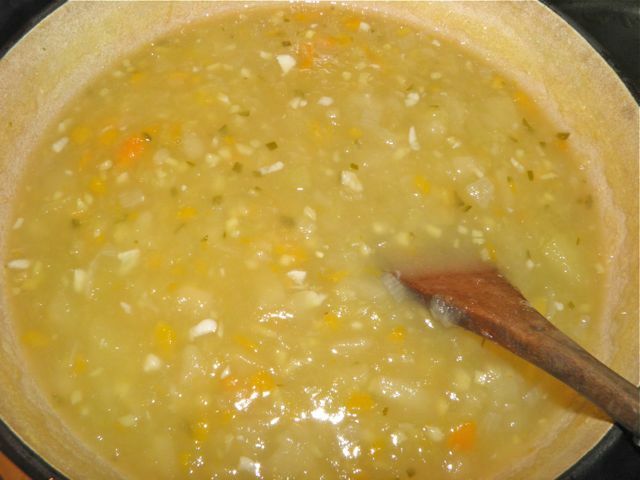 If you wish, you can continue to cook to make the chutney thicker. Just be aware, the longer you cook, the fewer pieces of apple and pear will remain. you will get a thicker chutney, but less fruit pieces and volume. Peel and core the apples and pears and place in water with some lemon juice to prevent oxidation until ready to use. When ready to start, drain off the water. 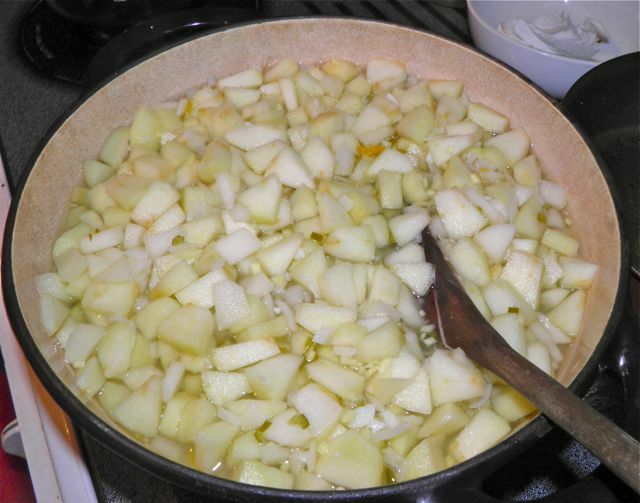 In large pot mix all the ingredients and cook until the apples are tender. This will take about 25 minutes. You don’t want the apples and pears to disappear entirely. There should be pieces left in the cooked chutney. If you reduce the chutney more than 25 minutes it will be thicker but with fewer fruit pieces. At 25 minutes it's about the consistency of applesauce. Taste and add more sugar if desired. Stir in the rum. 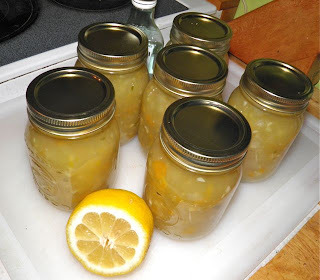 Spoon into sterile, hot jars and seal to finger tight. Once the tops have popped down tighten the rings more. Any that haven't sealed are not air tight and will not last without refrigeration.